Integrated pest management (IPM) is a pest prevention strategy that utilizes multiple techniques tailored to the ecological context of each situation in order to reduce pest populations to a manageable level. Phew, that's a mouthful! Not to worry - it's really not as complicated as it sounds. The development of IPM followed many decades of liberal pest control tactics in the agricultural industry. Pest control often involved the use of chemical treatments in increasing strength with little to no regard for beneficial organisms that were harmed along the way. Pest resistance quickly became a threat, as any targeted pests that survived the treatments passed their resistance down to their offspring, thus requiring harsher controls to be developed and employed. Occasionally, pests actually outpaced treatment development, resulting in large die-offs of the host organisms (i.e. crops), and caused significant economic losses. It became clear that a new pest control method was needed. IPM utilizes prevention, pest identification, population monitoring, and (as a last resort) treatments in order to reduce the target pest populations. Complete elimination of the pest is not the goal. Instead, we're aiming to reduce the pest population to a manageable threshold, mirroring host/pest interactions we see in nature. We would never see a pest population completely eradicated in nature; instead, we see populations suppressed by the hosts’ naturally occurring defense mechanisms. This is the kind of situation we are trying to create with IPM strategies! The keystone of IPM is prevention. This means leaning on stronger genetics, natural predators (biocontrol), and environmental factors to gain a leg up on pest species. Of course, these tactics are not always enough, and that’s where treatments come into play. Treatments can be mechanical, chemical, or a combination of both. When using IPM, we start with the most gentle treatment (to both humans and the host organism). If this fails, we move up the ladder to a stronger treatment. We can tell that a treatment is working by closely monitoring our pest populations. The ways in which we monitor will vary depending on the type of pest we are targeting. By treating only when necessary and using a variety of treatments, we can reduce resistance development in our target pests. How can IPM help beekeepers? For the last thirty years, beekeepers have been battling the varroa mite (Varroa destructor). Varroa mites are an introduced ectoparasite of the Eastern honey bee (Apis cerana). These mites feed on fat bodies of developing bees, weakening the bees and spreading disease in the process. Eastern honey bees evolved with the varroa mite, allowing them to develop the necessary survival mechanisms to combat this parasite. Due to these evolutionary defense tactics, populations of varroa stay naturally suppressed and do not cause the colony deaths we associate with mites in the west. By feeding on the bees, the mites weaken them and transmit a number of viruses (ex. deformed wing virus, acute bee paralysis). These viruses, in combination with heavy mite loads, can quickly collapse a healthy colony; a fate many beekeepers are all too familiar with. Deformed Wing Virus, a virus transmitted through varroa mites. Beekeepers have used a plethora of chemicals and control tactics to try and suppress these invaders from spreading through their colonies. These treatments were often strong chemical miticides. This is particularly true in the commercial world of beekeeping, where failing to suppress mite loads means huge economic losses, and ultimately, the loss of entire beekeeping operations. These chemical treatments were highly effective until small groups of non-affected varroa became resistant and began to spread, rendering the controls ineffective. By practicing IPM, we can work towards the ultimate goal of pest prevention. By monitoring your mite loads, you will be able to recognize hive issues before it’s too late. I often hear beekeepers say they do not believe varroa mites are present in their hives, and this likely stems from the fact that it is incredibly difficult to spot varroa on adult bees. Mites cling to the underside of a bee’s abdomen in between her abdominal segments (called the phoretic stage), and many others are hiding under capped brood cells. Unfortunately, the mites are there - even if you don’t see them. To start out, take a cue from nature to provide the best and most natural home for your bees. Feral bee colonies living inside tree hollows have naturally lower mite loads. While we aren’t 100% sure why or able to replicate every element of a natural nest that helps wild colonies resist mites, there is evidence to suggest a few key elements have a strong positive impact. These include smaller nest cavities, allowing your bees to swarm, allowing your bees to build natural comb (foundationless frames or top bars), and allowing propolis to accumulate. The next thing to consider is your colonies’ genetics. Not everyone can afford fancy mite-resistant stock, and we usually don’t recommend new beekeepers make this investment anyways. Instead, try to get bees from as local a source as possible. Bees that thrive in the environment you’re keeping them in will have a leg up against any pressures thrown their way. As your bees survive year after year and produce swarms or splits, they will become more locally adapted. 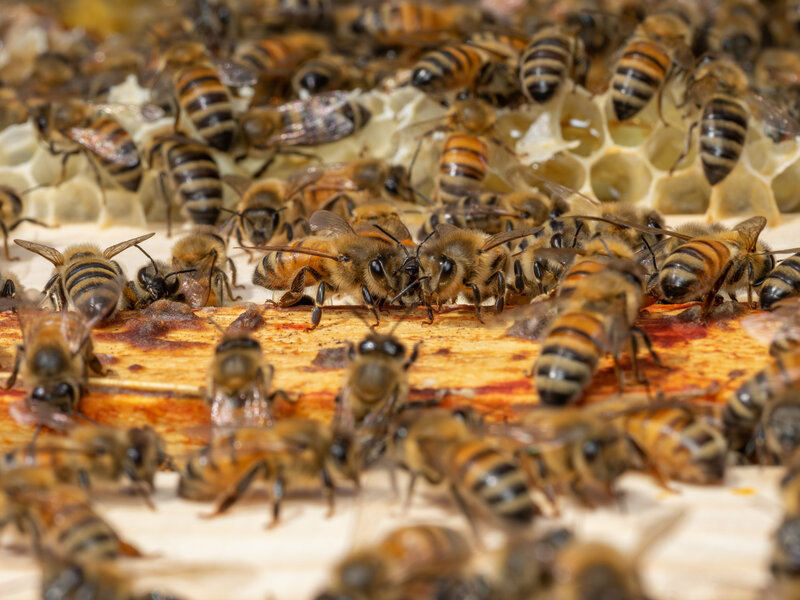 Some strains of honey bees are simply more vulnerable to mite infestation. If you notice a very high mite load in your colony, you can actually use genetics as a method of biocontrol. Try requeening with a hygienic or more locally adapted strain. As you become more experienced, you may consider investing in varroa-resistant stock to compare success rates and mite loads - but start slow! The best (and really only) way to know if you have a mite problem before your bees are overloaded with viruses is to monitor. There are several ways to monitor mite populations and activity in your hive. Some are passive, and some are active. Many people choose to monitor natural mite drop using a screened bottom board with a sticky insert. This is the least invasive way to monitor, but it is also the least representative of the actual mite population in the hive. Jar methods of mite monitoring will give you a much better idea of how many mites are in your hive. Each jar method involves removing and counting the phoretic mites from a sample of 300 bees taken from the brood chamber of the hive. Both the alcohol wash and the ether roll test do kill your bee sample, while the sugar shake does not. All three are effective ways of monitoring mites loads, so pick the option that works best for you. Mite monitoring should occur at least once in the spring, summer, and fall. Collecting a bee sample for a mite test. The mite test results will determine if further action is required. If the threshold is acceptable, there is no need to intervene, but you will want to continue monitoring in case anything changes. If the threshold is above acceptable levels, you'll need to decide how to respond. If you use a treatment (be it mechanical, chemical, or a combination), a follow-up mite test is required to ensure that the treatment was successful. A note on chemical treatments: You do not have to use harsh chemicals to successfully implement IPM strategies. If you are a treatment-free beekeeper or do not feel comfortable using miticides, you can still employ IPM in a successful way. We recommend monitoring mite populations regardless of your stance on the use of chemical treatments, and there are many non-chemical ways to defend your hives against mites. An example would be using robbing screens on your hives to reduce mite transfer during robbing events or creating brood breaks by allowing swarming, by splitting, or by using a push-in queen cage. If you do treat, remember that more does not mean better! Follow the directions carefully. Using treatments incorrectly can render them ineffective, and can put you and your bees health at risk. Make sure you follow any treatment with a mite-monitoring test to ensure that the treatments are having a positive effect. The wonderful thing about IPM is that you are free to get creative and use a combination of tools that fit your beekeeping philosophy to meet your goals. And… you don’t have to stop at beekeeping! You can use IPM tactics when dealing with any pest species (like aphids in your garden or fleas on your dog). By identifying, monitoring and using a thoughtful escalation of treatments, you can help create a healthier and more balanced environment.